1.1 Where can I find the quests? Every player is presented with a series of quests in the beginning of the game. By completing these quests you gain rewards, such as resource boosters, premium features, units, etc. There are different types of quests, all of which are separated into different quest groups. The quests' focus is to guide you through your first steps in the game. Where can I find the quests? You can find the quests on the left. They will be looking like the picture to the right. Each quest group is made up of a number of quests that need to be done before you can continue to new quests. 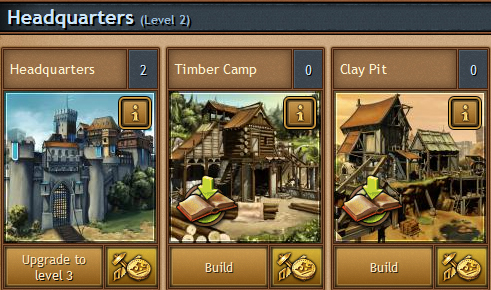 Quest indicators in the headquarter will help you determine which buildings you need to upgrade to finish an active quest. Part 1 - Knowledge is power As the Agricultural Leader has said, knowing how units effect your village is very important. You can always look at a more detailed overview of your units, knowing where they are going and what units are coming into our village for support or attack, by clicking on the Units tab. Part 2 - Two ways In the Barracks you will see there are two categories of units to pick from, offensive and defensive. Offensive units, like the Axe Fighters are great to use against villages to gather loot, while defensive units, like Spearmen are better for keeping our village safe from enemy units. We need more volunteers for our army, but if you look at the information about each unit type you will see that they require different resources. For example the Spearmen only take 1 Provision each, while the light cavalry takes 4. Let’s recruit units worth 20 Provisions. Part 2 - Defenders It is important to note what units are effective against others. Spearmen are good against cavalry units, Swordsmen take down infantry units easily and Archers are effective against other archer units. Heavy Cavalry is very expensive, but they are the elite of defense, as they have no weak points. I have outlined our units strengths and weaknesses in my information reports if you’d like to examine this in further detail. Now that our renovations to the Barracks have been completed we can start training our villagers into Swordsman. Part 3 - Support! Once we have established allies in the province we can send them support. This will send out our units to help defend the supported village until you give orders to bring them home or the lord or lady in the village sends them back. Sending a wave of supporting troops can be a sign of friendship between two neighboring villages and may prove to keep peace between the two cities. But Beware, my Liege, some of these lords and ladies are backstabbing snakes waiting for you to let down your guard. Part 5 - Countermeasures The only thing better than fighting off enemy Spies, is to deceive them. We can create counter measures in your city to trick an enemy spy. We can Camouflage our buildings, making them seem more or less important to us. I can have Dummies placed upon the wall to look as though we have more troops defending us. I could make our troops swap places and make it seem like our Spearmen are Axe Fighters and our Axe Fighters are Sprearmen. Part 2 - The Hall of Orders Your Grace, we have drawn up blue prints for three different options for your grand Hall of Orders. The Templar Knights are very effective at lowering the cost of offensive units. The Teutonic Knights are very effective at lowering the cost of defensive units. Lastly, there is the Thieves’ Guild, who are very effective at lowering the cost of minting Coins. It is your choice which Guild we allow into our Halls, my Liege. This page was last modified on 1 April 2017, at 20:07.